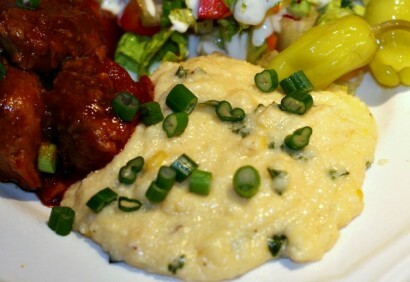 Grits are a fantastic side and can be cooked and used in so many ways. In a short few months, we will be coming up on fresh corn season. Use the recipe, below, to kick-up your next grits dish. Heat the butter and canola oil in a large saucepan over medium-high heat. Add the corn, season with salt and pepper and cook for a few minutes. Add the milk and 3 cups water and bring to a boil. Slowly whisk in the grits until well combined and continue whisking until smooth. Reduce the heat to low and cook, stirring occasionally, until thickened and smooth, about 45 minutes; add more water as needed to keep the mixture creamy. Remove from the heat, and whisk in the cheddar and Parmesan.